Cuba has been on my bucket list for years. I’ve been assured by many of my well-travelled friends that as long as Fidel Castro is alive (and the US embargo is on) the country can maintain its authenticity. I had the opportunity to visit in April, a couple of days after Barack Obama’s (and the Rolling Stones’) historic visit to Cuba. While tourism is booming, it is still very much authentic. While immersing yourself in the rich history, the culture and the scenery, you can’t deny that there is a healthy feeling of hedonism in this country: after all Cuba is famous for classic cars, music, cigars, and RUM! So what better way to learn more about the country and the history than by drinking my way through Cuba with a map in one hand and a rum cocktail in another? My trip started off in Havana and my first rum drink was an obvious choice: Cuba Libre, a mix of rum (dark or light), lime juice, and cola. 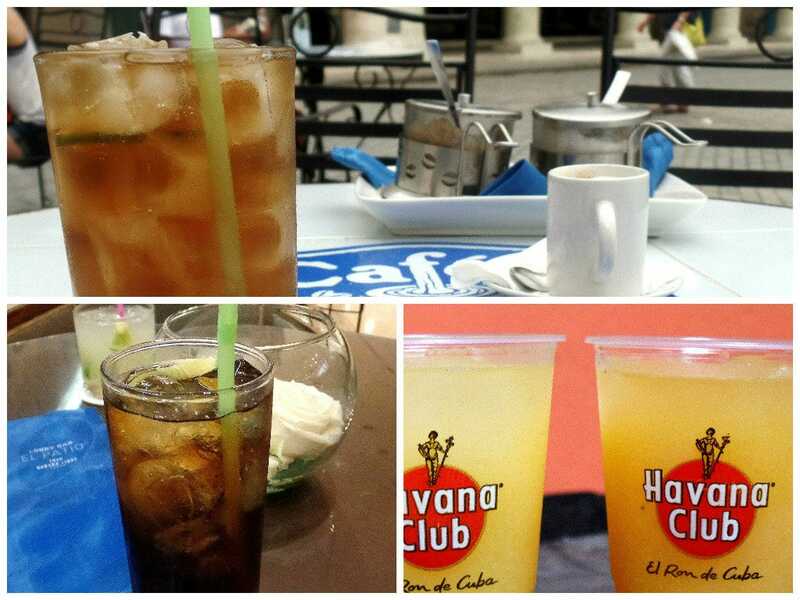 There are many stories on how the drink came about: the most popular one is that it was invented in Havana in 1901 or 1902. The name translates to ‘Free Cuba!’ in Spanish. It came from the battle cry of the Cuba Liberation Army, active during the war of independence that concluded in 1898. Rather unintentionally the scene of my debauchery was another nod to the history of Cuba – the bar where I had the drink is located in the Habana Libre hotel which at one point was Fidel Castro’s headquarters for a couple of months in early 1959. My next rum cocktail was a variation of this same drink: Cubalibre al cafe, it was made of rum, cola, and coffee liqueur. I’m not exactly sure why I thought that mixing a cocktail with coffee liqueur would work… it didn’t. It might have been the heat or the atmosphere of the lovely Plaza Vieja that made me do it, however the flavours just didn’t mix well and it ended up tasting quite unpleasant. Luckily the previous bad experience didn’t discourage me to continue my assignment. My next cocktail was a Guaravan/Guaranejo at the Rum Museum in Havana. It’s a great museum if you want to learn more about the history of rum, how it is made, and how it shaped the culture of Cuba. The best part though is the super-refreshing drink you can purchase while waiting for your tour to start (or as a wrap-up): the ingredients include orange juice, sugarcane juice (freshly pressed in front of you), ice, and a 3 year old rum in the Guaraqana or a 7 year old rum in the Guaranejo. I could write hymns about this drink: it’s just sweet enough to give you energy but the rum will give you a lovely light buzz. We moved from Havana to Vinales, a city approximately 190 km from the capital, and one that boasts an amazing scenery. By this time I have been through a couple of Cuba Libres, some with lime only as decoration while others using lime juice. The El Olivo restaurant on the main street of Vinales served the latter, and I’ll forever be grateful for them. Not only did they serve amazing cocktails but the ingredients and the cuisine were 100% local. It’s definitely worth checking out after a day of sightseeing in the area. After a 5-hour drive in a classic car (which made me feel like I was in a Mad Men episode) that was definitely not made for such long distances, we arrived to Cienfuegos, the ‘Pearl of the South’. It is also birthplace to a great Cuban musician, Benny More. One of the many sights of the city is the Palacio de Valle, built in Gothic, Romanesque, and Baroque styles. It hosts cultural events, a restaurant, and a roof-top bar with a great view. I might have cheated here a bit when I ordered a Ron Collins, which is a Spanish variation of an American cocktail, Tom Collins. The latter is made with gin while the former is made with, you guessed it, rum (‘ron’ in Spanish, hence the name). It’s a wonderfully zingy drink and a new favourite of mine. The next stop on our trip was Trinidad. It has been a world heritage site since the late 1980s, and it’s easy to see why: the beautiful stained-glass windows of the colourful houses, the cobble-stones across the old-town, and the slow-pace of the town feels like time stopped here and nobody seems to mind. After a day of walking along the winding and narrow streets of Trinidad in the heat, we decided to try one of the ‘local delicacies’, the Canchanchara at a bar with the same name. The origins of the drink date back to one of the many wars of independence the Cubans fought against the Spanish between 1868 and 1899 during which the pro-independence Cuban guerilleros regularly suffered from malnutrition and morning cold – as an antidote to both problems, they mixed a drink that was made of readily available ingredients, helping them gain energy and clear their head… tsk… tsk. I can’t say with 100% certainty that it had the same effect on me but it was definitely a heaven-sent drink after a day of walking around in the heat. The traditional canchanchara mixes eau-de-vie (or rum at a stage before it actually becomes rum), honey and/or molasses, lime, a bit of water, and finished off with a couple ice cubes. Invigorating! Before we left our penultimate stop in Cuba and headed off to the sweet all-inclusiveness of Varadero, we had a lovely night out at the Restaurant La Redaccion. Still in the city centre but on a quiet street, I loved the newspaper/journalism theme of this place. My last unique rum-cocktail of the trip was a Trinidad Colonial, a mix of Grenadine, orange juice, rum, and Blue Curacoa – the colours and the flavours almost popped out of my glass. According to the owners of the place, this cocktail is an homage to the wonderful stained-glass windows on the old Trinidad houses. 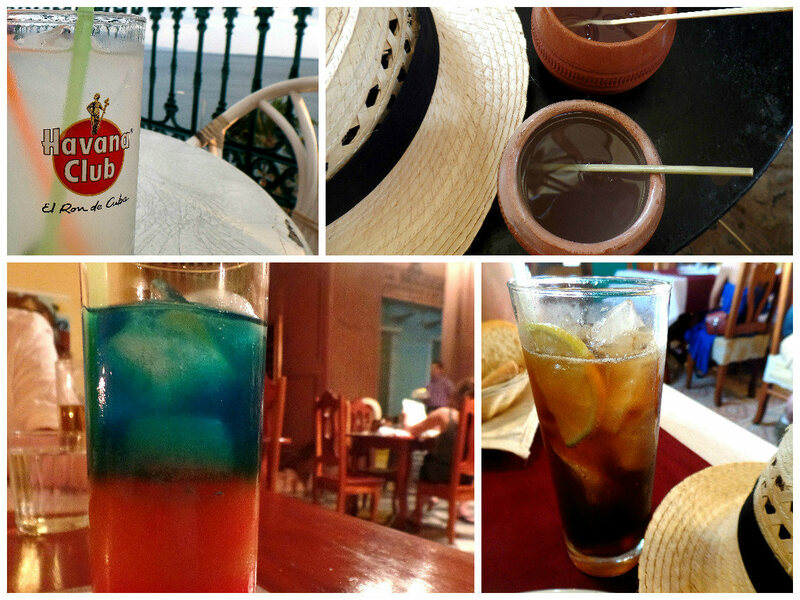 It really was a sweet-goodbye to this amazing country full on contrasts, beauty, and rum!